Latest news: The City has created a web page describing revised project plans received on November 20, 2018, and differing in appearance from the earlier images used above. The application remains “incomplete,” but the applicant continues to confer with a coalition of area residents and business owners who call themselves Protect Mariner’s Mile (and who were not told about the revised plans). The SPON Board, also, expects to hear a presentation from the applicant on January 15. Meanwhile, on October 18 — despite promises that none of the existing uses would be changing prior to approval of the redevelopment — the Planning Commission heard an application to convert the existing office building at 2244 West PCH into a luxury automobile showroom. That application was approved at their November 8 meeting. 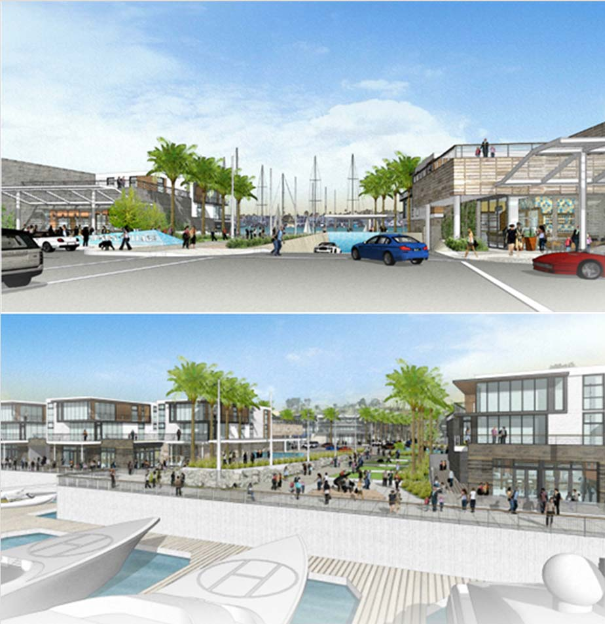 Project Overview: As originally submitted on on December 4, 2017, this application for a major “mixed use” development on the former “Ardell” properties along Mariner’s Mile (at the present Duffy Boats through A’maree’s sites and the boat sales/storage yard across PCH from them) was to consist of 11.05 acres on which would be built 175 residential units, 240,650 square feet of office, retail and restaurant uses, and a new 75-boat marina. All the existing buildings were to be demolished, and a new signalized intersection on Coast Highway created to serve the project. The revised plans submitted on November 20, 2018, removed the property to the west of A’maree’s, reducing the project area to 9.4 acres. The originally-proposed 175 residential units have also been reduced to 14 condos on the waterfront and 108 apartments on the inland parcel, with a total, between the two, of 121,370 square feet of office, boat sales, vehicle sales, retail, and restaurant uses. The A’maree’s building would be preserved in the new plan. Why We’re Watching: In 2016-2017 the City spent considerable money on a “Mariner’s Mile Revitalization” planning effort, which was officially withdrawn pending a possible General Plan Update (which now also seems to be in an uncertain state). Although the official purpose of the 2016-2017 effort was to solicit public input on the future of Mariner’s Mile, and develop a plan for future development consistent with that, many felt, at the time, that it’s purpose was geared more toward forcing a vision on the public to justify this redevelopment project, now known as Newport Village. In that connection, many felt the the existing Mariner’s Mile Strategic Vision and Design Framework, adopted in 2000, stated the public’s vision better than anything coming out the the new workshops. Given public reaction to the 2016-2017 Mariner’s Mile Revitalization workshops, as well as City staff’s endorsement in 2016 of the rejected AutoNation proposal for a large new auto dealership cutting into the bluffs along Mariner’s Mile, SPON will be keeping a close eye on “Newport Village” as further details of the project emerge. January 15, 2019: At the beginning of its regular meeting, the SPON Board expects to hear a presentation requested by “Newport Village” the development team. No City-sponsored meetings are currently scheduled on the Newport Village application. An Environmental Impact Report will almost certainly be required. The Scoping Meeting for that will likely be the first “official” presentation of a definite proposal to the public. December 20, 2018: City sends second “incomplete” letter. November 20, 2018: Revised project plans submitted to City per case log. November 8, 2018: The Planning Commission approved the application for a luxury car showroom at 2244 West PCH (one of the properties proposed for eventual redevelopment). Note: although it is not clear from the City’s website, the revised project plans submitted to the City on November 20 may indicate this building will be preserved, and not redeveloped. October 18, 2018: As Item 6 on its agenda, the Planning Commission heard a proposal to convert the existing 15,823-square-foot office building at 2244 West Coast Highway into a pre-owned luxury automobile sales showroom. The property is outside the areas designated for auto-related uses in the Mariners’ Mile Strategic Vision and Design Framework. The Planning Commission is expected to make a decision on the application at their November 8 meeting. May 21, 2018: The property owner erected “story poles” (poles between which strings representing edges of a planned building are hung and draped with flags) on May 21, to illustrate, for the benefit of Newport Heights neighbors, the size of part of the proposed construction. They were reportedly removed on May 24. December 4, 2017: Application submitted to City. Trivia: Perhaps unknown to the applicants, “Newport Village” has been in use since 1983 as the official name of the 33(?) acre planned community in Newport Center lying between Avocado and MacArthur — originally from PCH to San Miguel, but later extended to San Joaquin Hills Road. That “other” Newport Village is home to the City Hall, Central Library, Civic Center Park, OCTA Transportation Center and the Corona del Mar Plaza Shopping Center (containing Bristol Farms Market and many other shops). “Newport Village” is also the name of an existing apartment complex at 635 W. Baker St., near the airport in Costa Mesa. This entry was posted in News, Watch List and tagged Development proposals, mariners mile, Newport Village on December 26, 2017 by Jim Mosher.